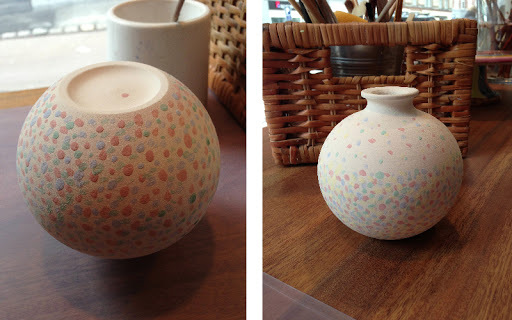 I love being creative and whilst I am not the best painter in the world, I enjoy painting ceramics. 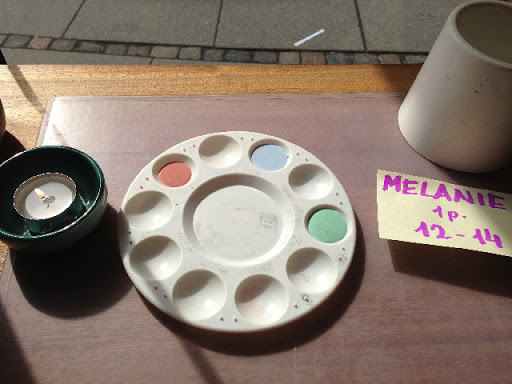 I was delighted when, a few years ago, a ceramic painting shop opened here in Frederiksberg aptly called Creative Space. I have always gone alone and this is a big treat for me as mum of a very busy little boy. The set up is simple but very enjoyable. I usually book a space and when you arrive your work space is set up with everything you need – brushes, water, cloth and empty paint palette, and of course, as this is Denmark, a candle. You then browse the shelves of plain, unfinished ceramics and once you have made a choice, tell one of the super helpful assistants who will bring the piece to your work space. You then chose your paints, stamps, stencils etc from a selection available. There are baskets of magazines and books for inspiration. The staff are also ready to answer any questions and on your first visit run though everything with you when you arrive. Having made the mistake years ago at a similar place in the UK, where I sat and stared empty minded at my chosen piece of ceramic for about half an hour, I now plan what I will paint before I come. This time I wanted to do a delicate pastel vase and inspired by the constant presence of snow this winter I chose to do a confetti snow fall – I hope it comes out as well as I imagine. So once you know what you are going to do, you then while away a lovely couple of hours. It has a great atmosphere; relaxing but up beat music and there is always a great mix of people from large groups, families, single people and those a lot more serious about their work. Once you have finished and paid it is about a week and then you collect your finished masterpiece.